Windows Archives | Masonry Technology, Inc. Published By: The Journal of Light Construction| Date: November 2018 | Author: John H. Koester & Tyler LeClear Vachta - Masonry Technology Inc. Figure 2: A “stucco bucket” on this stuccoed cantilever resulted in the wall kicking the bucket, so to speak. 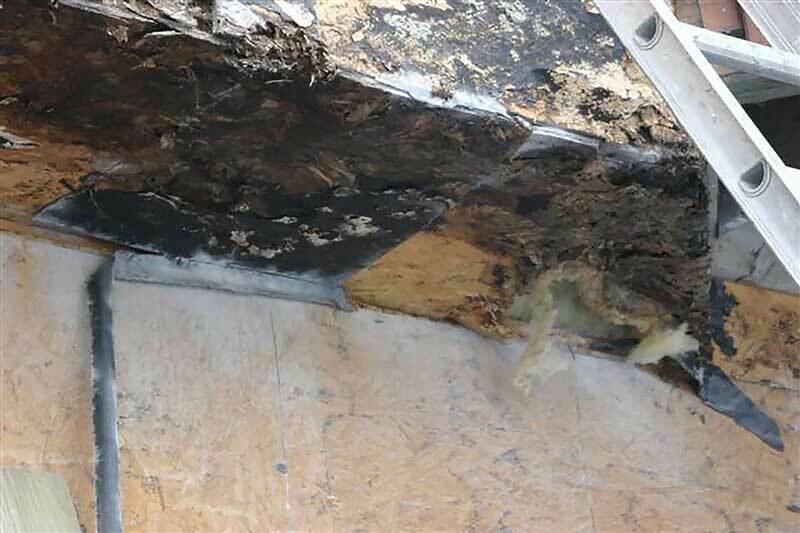 Water had nowhere to drain and eventually overwhelmed the WRB, rotting the framing beneath. Detailing an exterior sure would be easy if all houses were simple boxes with only four corners. It would be a lot easier if they didn’t have all of those windows, too. Of course, those are not realistic options. In the real world, we always need to rely on deflection, drainage, drying, and durable materials to prevent moisture problems. 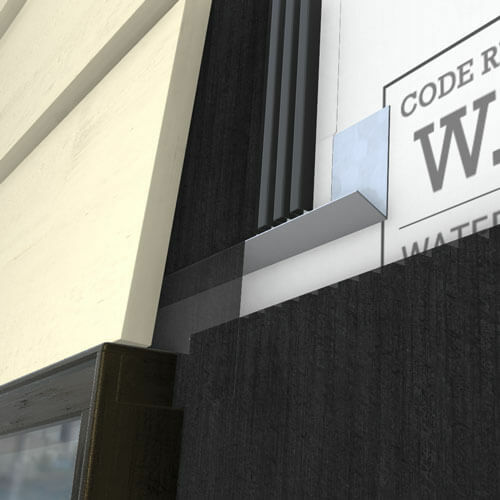 The rainscreen principle uses an air gap over a water-resistive barrier (WRB) to create a capillary break. That break allows gravity to drain liquid water; when detailed properly, it also provides ventilation to dry out materials. We need to rely on the rainscreen principle more than ever in high-performance buildings to help out the drying side of the equation. As increased levels of insulation and air-sealing have reduced energy flow through walls, they have reduced the drying potential of building assemblies as well. But the rainscreen principle involves a system, not a single component, and as we detail the numerous components of that system, we need an exit strategy for the water. These days, providing an exit for water behind stucco is often straightforward and installers are familiar with what to do. While we still see some cases where weeps and weep screeds are left out at the base of the wall, the most common problem areas for moisture intrusion are windows and what have been termed “stucco buckets” by Jeff Bowlsby of Simpson Gumperts & Heger and stuccometrics.com. 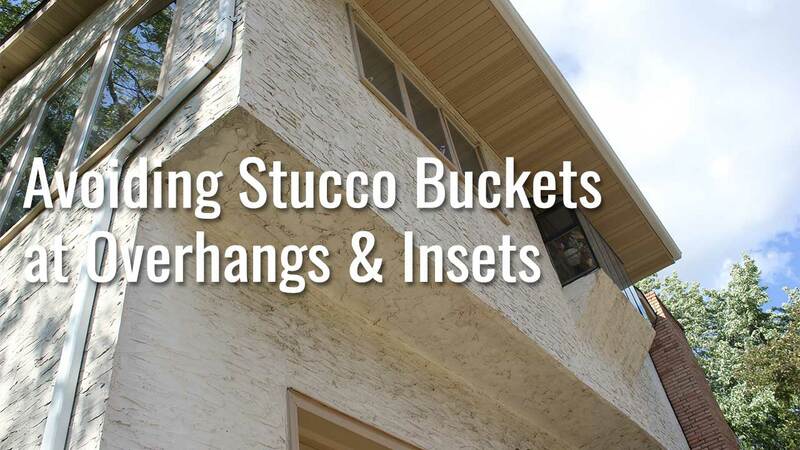 A stucco bucket is an overhang where the stucco wraps from the vertical wall to the horizontal surface underneath, without anywhere for liquid water to drain out. Like a bucket, stucco-wrapped soffits hold water and let your wall components marinate until the lawyers say you need to do something. These problems aren’t limited to stucco, which has been dragged through the mud more than its fair share for poor detailing and execution. Thin-brick, adhered-stone, and even fiber-cement-siding walls suffer the same fate from the wrapped detail. Any time the drainage plane is interrupted, we need a plan for the moisture to exit. We give the moisture “somewhere to go” by providing a reveal and vented termination at the change of planes. To misquote an old children’s song, “Put a hole in the bucket, dear Henry, dear Henry.” The most straightforward approach to avoiding stucco buckets is to include a reveal that drains and ventilates the rainscreen air gap (see figure 3). Just let the water out. Where do we need these reveals? Wherever the water control layer changes plane, whether it’s a full 90-degree corner or a smaller angle. To identify those changes of plane, use the pen test, which is a simple and important process for verifying control-layer continuity on building plans. Use different color pens to trace the water, air, and thermal (insulation) control layers on the wall section details. If you need to pick up the pen at any point, there is a discontinuity with the control layer. In terms of drainage, any time your pen turns while tracing the water control layer, you need to flash or drain. Flash and slope when the pen turns outward; let the wall drain to the exterior when the pen turns inward. The extremely practical reveals shown in the “Drainable Reveal” illustration might not always offer the desired aesthetic, but gravity doesn’t care about aesthetics, and we may need to alter our approach. We do always have to play by gravity’s rules, but in some cases, it is possible to divert the drainage to a concealed outlet. One common place this is often required is with “innie,” or recessed, windows. These are currently popular with many designers, but creating a drainage reveal over every opening is not compatible with thin stone and thin brick. This cladding uses corner pieces at the header to deceive the eye into believing the wall has a full-wythe veneer. Using a drainage reveal, in this case, would preclude the use of the corner pieces and reveal the thin veneer’s secrets. Use rigid exterior insulation to create the inset aesthetic, with the water control layer between the sheathing and rigid insulation. 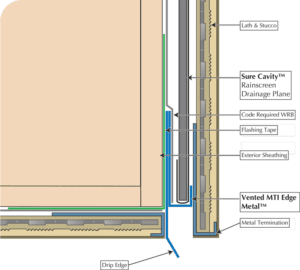 Detailing the water control layer behind the rigid insulation is typically more straightforward, but use an air gap to avoid repeating the painful past. 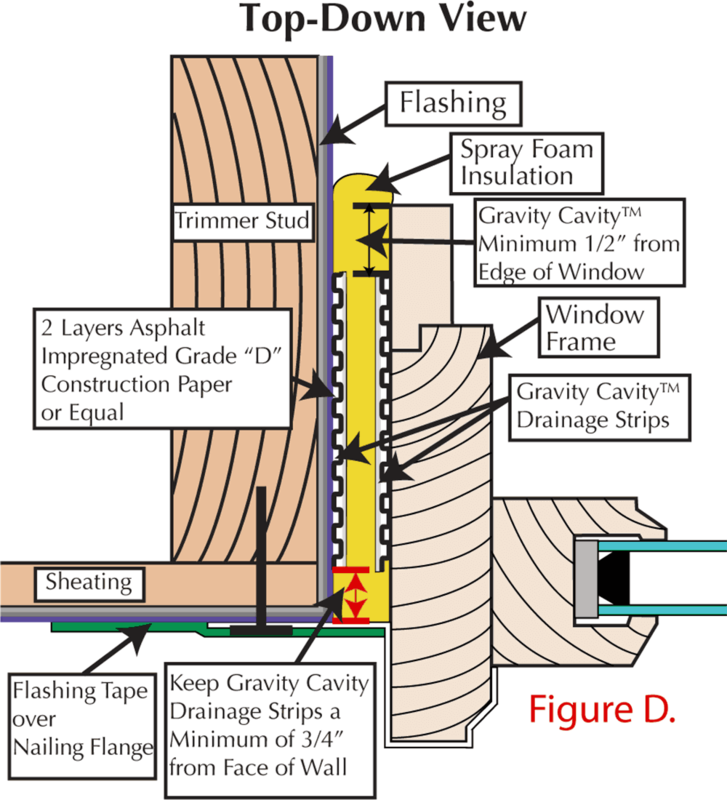 One solution is to borrow an idea from the EIFS folks: Use rigid foam to create the inset aesthetic with the drainage plane between the foam and the sheathing (see Figure 4). This resembles an inset window in an EIFS wall—just limit the air gap to 1/8-inch drainage gap to maintain 95% of the insulation’s R-value. Not using exterior rigid foam? Then we’ll have to create a diversion. No, we are not trying to confuse the water—let’s just hope we don’t confuse the designers or installers too much. The illustrations at left show how it’s done. This diversion strategy still relies on gravity. Over a rough opening, we flash the water-control layer to a small moisture-diverter channel that is installed at a 1/4-inch-per-foot slope and extends 4 inches past the opening on both sides. 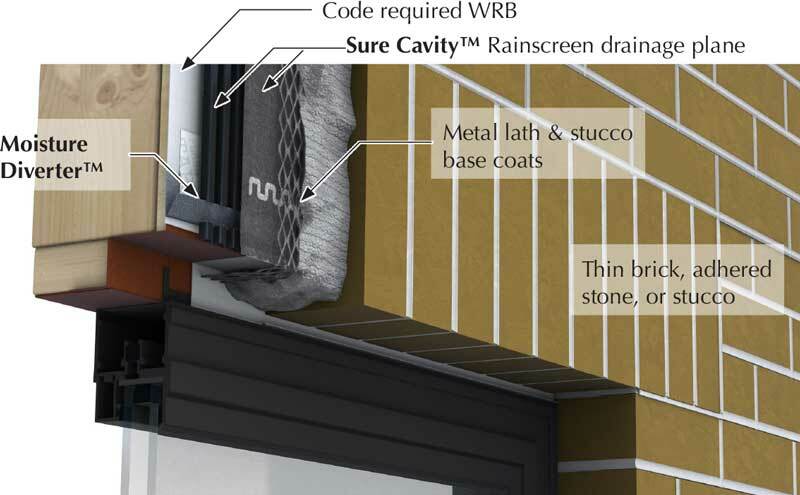 This moisture diverter must be integrated with the WRB and the rainscreen air gap. Any liquid water draining through the air gap is safely diverted away from the rough opening and put back on course to drain to the bottom of the wall. Remember, at the bottom of that wall, there must be weeps, or a rainscreen-compatible weep screed, to let the water out. 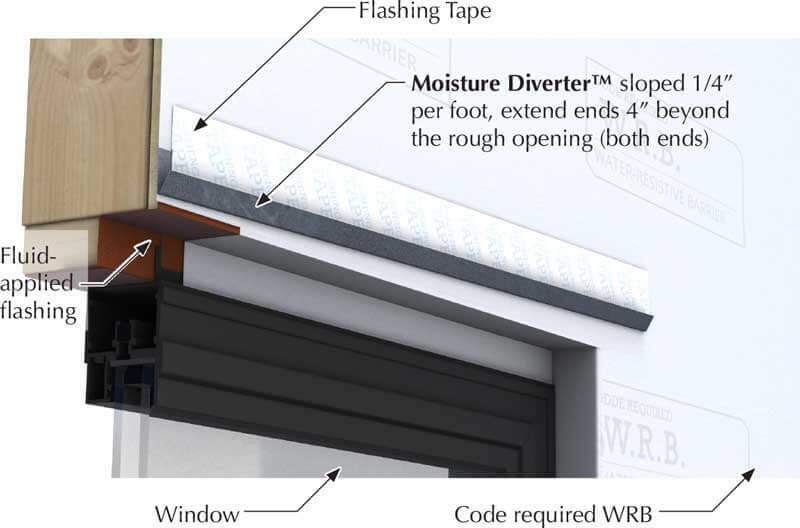 This moisture-diverter approach is entirely concealed when the exterior is completed. Even when dealing with “outie” and “tweenie” windows that drain above the rough opening, diverting moisture away from this high-risk zone is a good example of belt-and-suspenders moisture management. We need this redundancy at windows. Consider fluid-applied flashing for the recessed windows to simplify the origami that is otherwise required with peel-and-stick. Fluid-applied reduces the cumulative thicknesses of flashing with tapes. Also, put some slope on those sills when framing the openings. Sealants around the window will not last forever, so sloping the sill to drain prevents moisture from accumulating and causing problems. Also, keep in mind that the window frame and any masonry will expand and contract at different rates. If you run stucco or masonry right up to the window frame, you will get accelerated cracking and exposure to moisture. 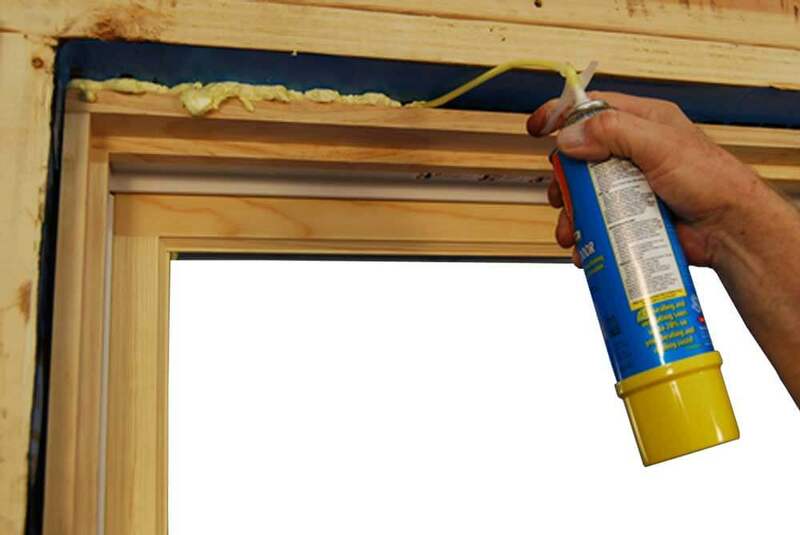 Keep a more flexible seal around the windows, using backer rod and sealant between the window frame and the cladding. The goal is to build a predictable system. Use sealant to reduce cracking and rely on the rainscreen drainage plane behind the veneer to drain the water. Figures 6 & 7: The Moisture Diverter With the window already flashed the moisture diverter channel is installed at a 1/4” per foot slope to drain and flashed to the water control layer. The moisture diverter extends 4” past the window rough opening to reduce moisture at these high risk areas. Windows are common problem areas for moisture. History & building science show we can't seal perfectly, but we can create a path for drainage, and divert moisture away from sensitive areas. 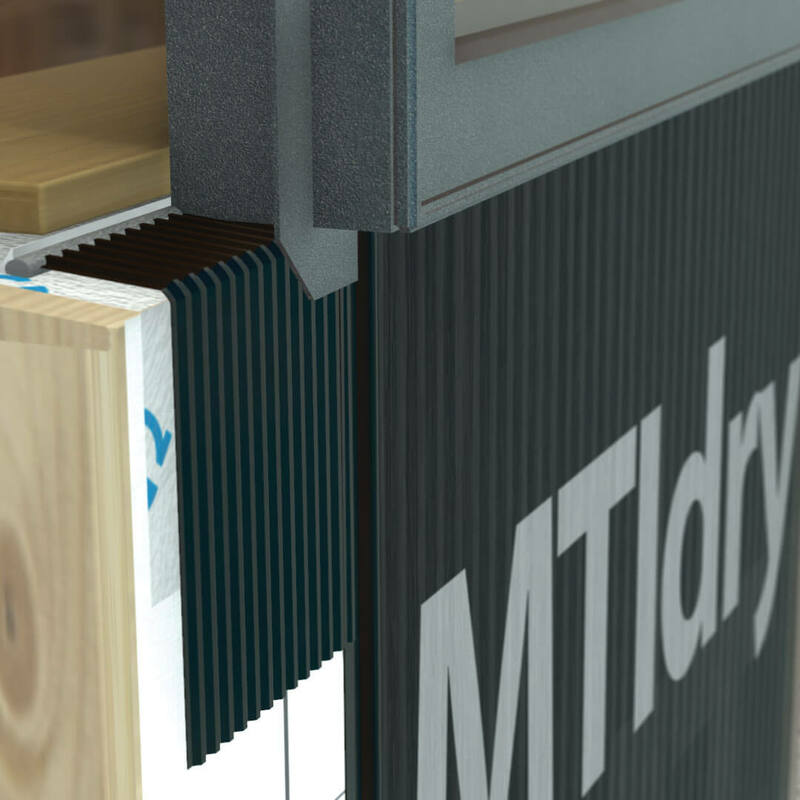 MTI provides a belt-and-suspenders approach for rainscreen assemblies to reduce the risk of water intrusion at windows. 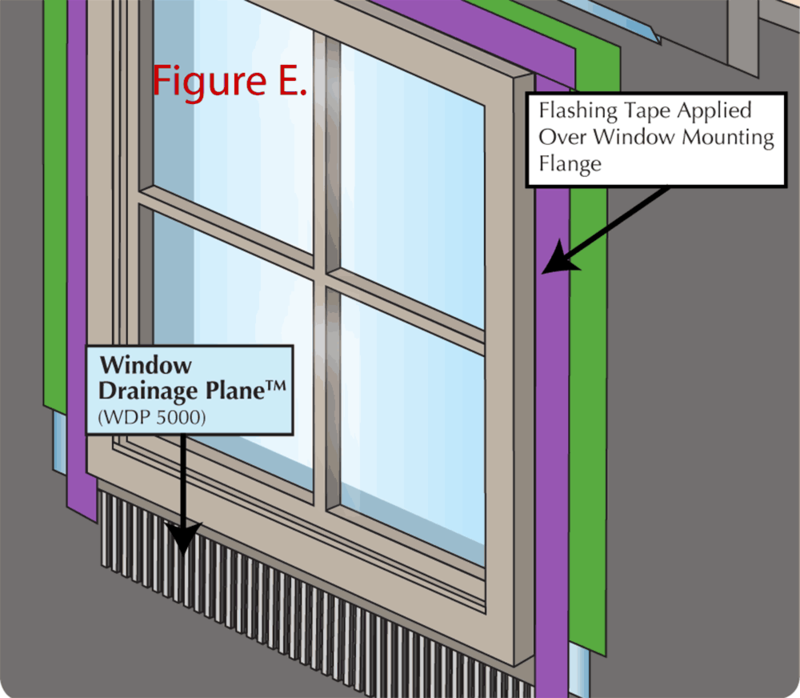 The Window Drainage Plane is installed on the flashed sloped-to-drain sill (a beveled piece of wood siding can be used to create the sloped sill). The channels in the Window Drainage Plane create a small air gap below the sill for drainage onto the WRB. The Moisture Diverter is flashed with the water resistive barrier (WRB) and installed at a slope-to-drain above the rough opening. This diverts moisture on the WRB and in the rainscreen drainage plane away from the rough window opening, reducing the risk of moisture accumulation. What about the air seal? Set the top and sides of the window flange in a sealant to help seal out moisture. The air seal is best installed at the interior of the window. with backer rod and a high-quality caulk. This limits the seal's exposure to wind, UV, and moisture while also creating a pressure moderated chamber beneath the window that assists with drainage. These best practice details take a little more time and result in an installation that will last the life of the wall. For Ordering and Expertise, call 1-800-879-3348 or Contact MTI today! The phrase “leaky, drafty windows” is common in the construction industry and, unfortunately, it seems too often true. However, the perception may not be the reality. There may be leaks and drafts in close proximity to the window, but the window units themselves may not have anything to do with the problem. In many cases it is the wall system that the window unit is installed in that may be the actual source of the leaks and drafts. We need to focus our attention on the rough opening to conquer some of the air and moisture problems blamed on windows. The areas where two or more different construction products, details and systems intersect are always places of potential risk. Incompatibility of products or designs and poor communication between the various people involved (architects, contractors, tradespeople) are some of the more common scenarios that result in failures. In many cases the solution to the “leaky, drafty window” problem is to focus on the materials and methods used around the window rough opening. Exterior building envelope construction systems (roofs and walls) often fail in the detailing of openings, projections and transitions. The detailing process is complicated because it involves more than a single individual or discipline. The challenge is managing the various disciplines using a wide range of materials into a cohesive unit. The need for holistic building is imperative. Each party involved needs to know how their task, and materials used to complete that task, impact the final result. This may sound impossible, but it’s not. It may be difficult, but it can be accomplished, and if the parties involved in the construction process are truly committed to sustainable building, it must be accomplished! Start by understanding that perfection is the ultimate goal. The reality of imperfection is the risk of some type of failure. The real task is to modify risk in order to minimize failure. The first and most important task of moisture management, as it relates to construction products and details, is keeping moisture off of them. If water can’t get to the detail, it can’t damage it. The second task is to isolate as many details as possible. Identify risk zones and design details and concentrate on their intrinsic weaknesses. Once identified create a moisture solution. When a potential problem isn’t addressed in one area, it often leads to failure in another. 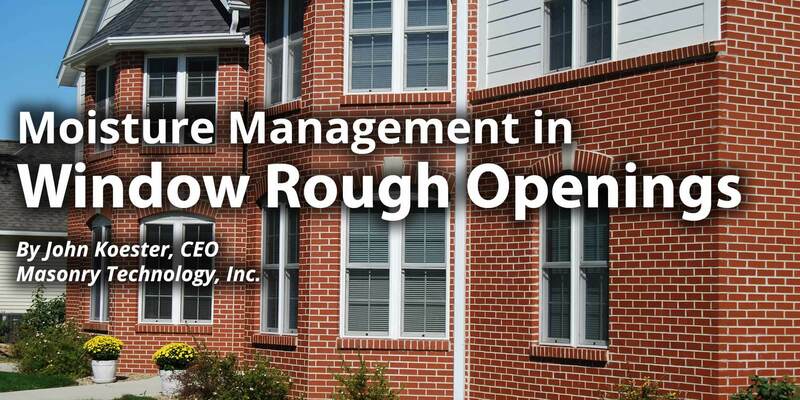 A poorly prepared rough opening develops leaks that then get blamed on the window. In reality had the window detail been properly addressed in the first place, a failure in an adjacent detail may not have happened. 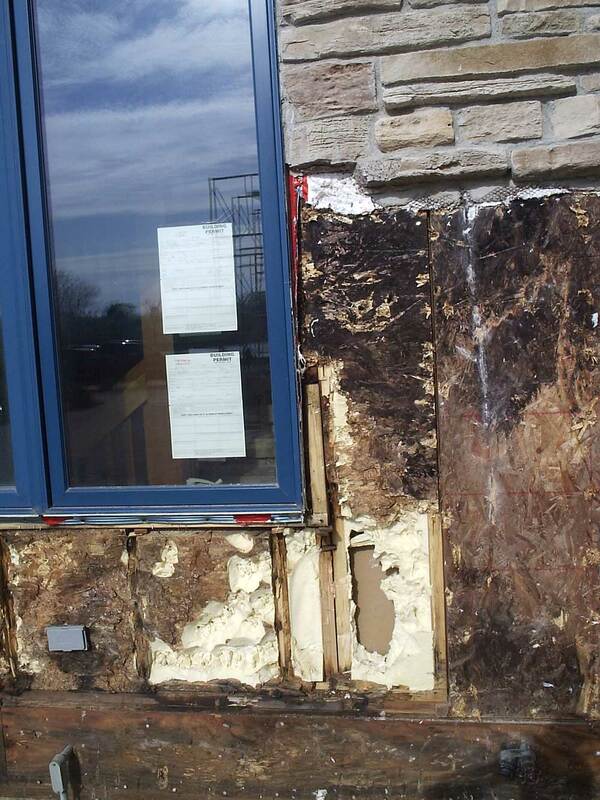 Many wall failures, both structural and veneer-related, are a result of a moisture management failure on a window installation (specifically, problems with preparation of the rough opening). 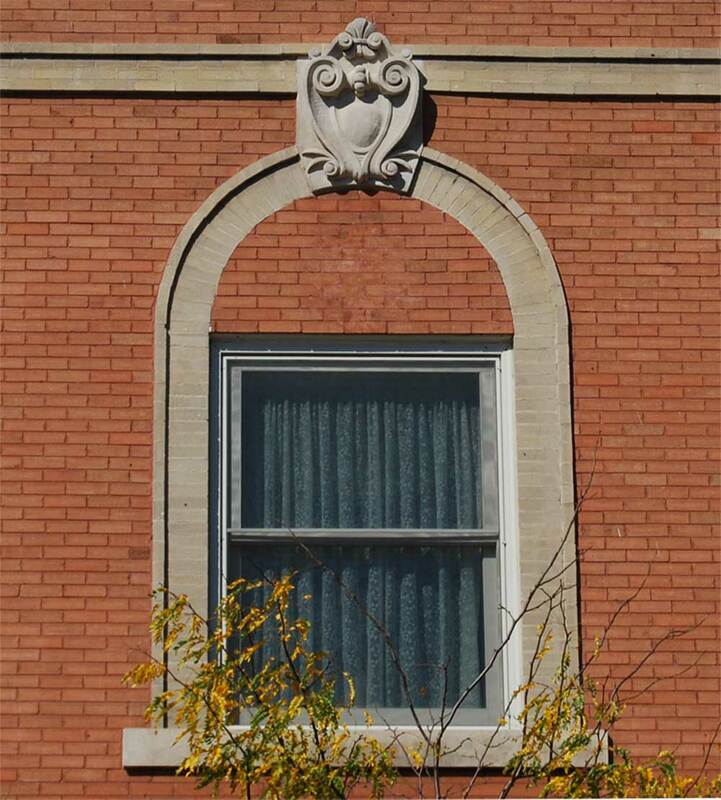 Moisture risk at the top of a window detail can come from a number of sources. Moisture that may have entered the wall system above the window and moved from the high point of entrance down to the top of the window detail with an open waterproofing system. When there are voids or chases in construction details of the exterior building envelope, the air that is in these voids, or that can move into them, must be controlled or conditioned. The control mechanism is usually some kind of vapor retarder membrane placed on the warm side of the detail and made as airtight as possible. When warm moist air can’t meet a dew point temperature, there is no condensation; therefore, no frosting. These voids also need to be filled with some sort of insulation to interrupt temperature transfer – no dew point temperature, no condensation problem. To a lesser degree, the voids at the sides of the window rough opening have the same condensation concerns as the top and bottom because the surfaces are vertical rather than horizontal. However, they are dependent on the top of the window being properly treated to manage moisture correctly so that it doesn’t allow moisture to move down into the voids at the side. The bottom of the window area is of greater concern. It can be compared to the bottom of a bucket; everything runs downward. Any and all liquid that gets into the window’s rough opening will accumulate at the bottom of the window rough opening. The accumulation of moisture at a low point in a window rough opening leads to absorption and migration into the surrounding details resulting in one of the most common failure scenarios in the construction industry. Cover the construction details that you don’t want to get wet with moisture-proof or moisture-resistant materials. Moisture should also be diverted away from construction details with drainage products as quickly as possible to minimize risk. The combination of a well-designed drainage system and a moisture-resistant or waterproofing system is the ultimate detail to manage moisture! Diverting water away from window details is not a new idea nor is it a new technology. Designing a pattern in the veneer immediately above a window has a long and successful history. What is not commonly known or understood in today’s construction and design industry is that most of the patterns in older historical building veneers were there to manage moisture and to move it off of, and away from, sensitive details such as windows and doors. This historical idea of diverting moisture away from sensitive details with architectural details can be applied today, but with a twist. A thin veneer with a predictable rain screen drainage plane affords an opportunity to apply this moisture diverter technology on the inside of the void of the rain screen drainage plane rather than by adding architectural details on the outside. Here are two examples of this moisture diversion practice of creating a detail above the window to move moisture away from the top and out and around the sides, one from the past and MTI’s “inside the envelope” solution. The back edge of the bottom of the window rough opening must have an elevation change that is higher and creates a back dam. A pathway must be provided for moisture to exit the wall detail once it has drained out of the window rough opening. 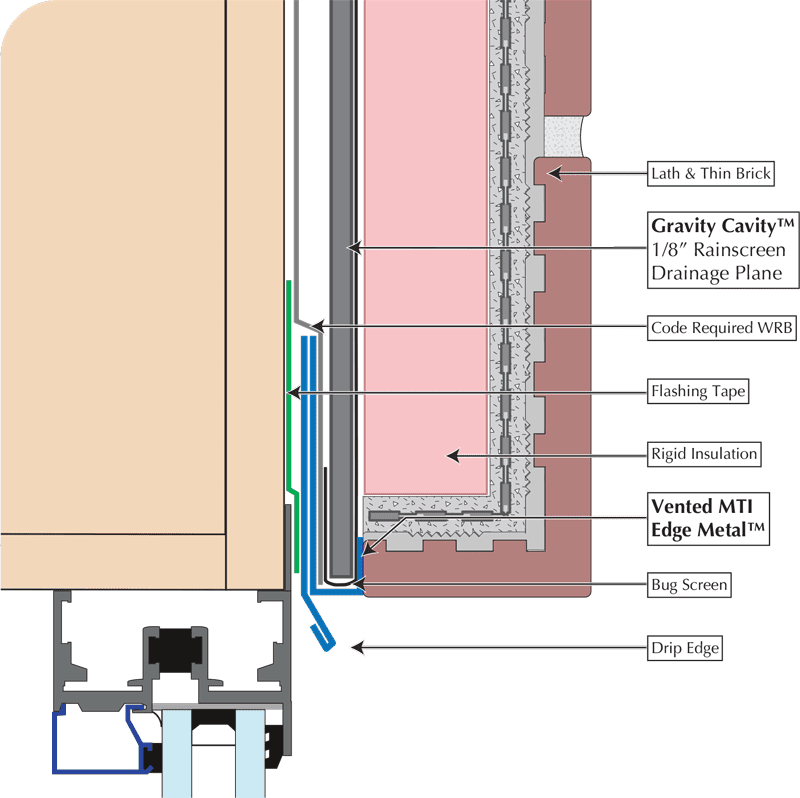 The Window Drainage Plane™ material will move water from the rough opening into the wall drainage plane (such as Gravity Cavity™ or Sure Cavity™). The next step involves moving water away from the top. Remember that moisture moves downward. 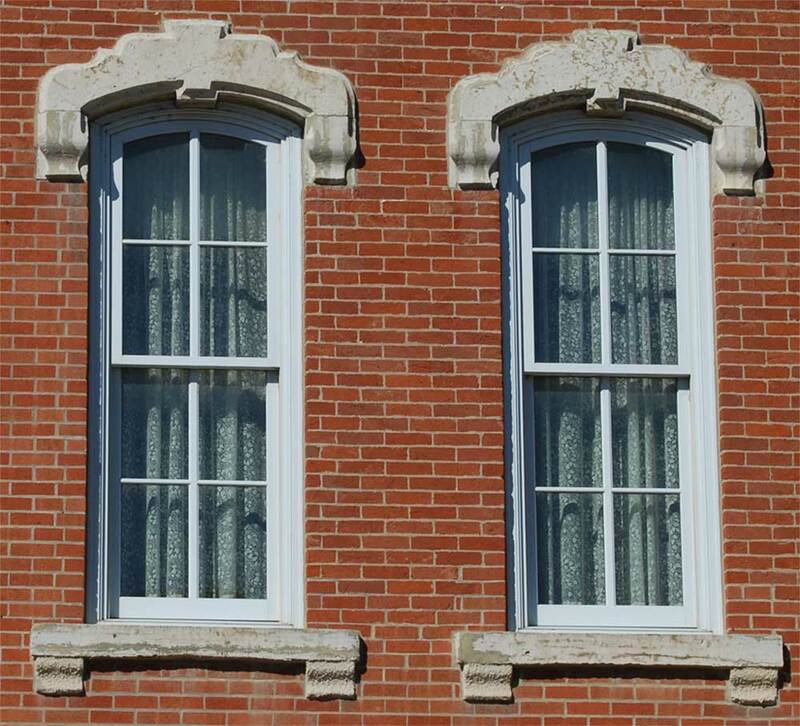 If we follow the examples from history that created external details away from the top of windows and doors, much of the moisture problem can be eliminated from the window rough opening. The only difference is that the moisture diverting mechanism is inside the building envelope. Apply Flashing Tape to the top edge of the Moisture Diverter. The layers of construction paper should overlap the top of the moisture diverter and extend down into the trough. Incorporating these practices into rough opening design gets moisture away from, off of and out of the window construction detail as quickly as possible. These practices constitute a well-designed rough opening. The voids at the top, sides, and bottom need to have predictable pathways to drain moisture that may enter these voids or that may condense in them. The voids also need to be insulated because they can allow air infiltration with negative results. The idea that moisture can’t get in, or that if the voids are filled with insulation there isn’t enough room for moisture, is just wishful thinking! 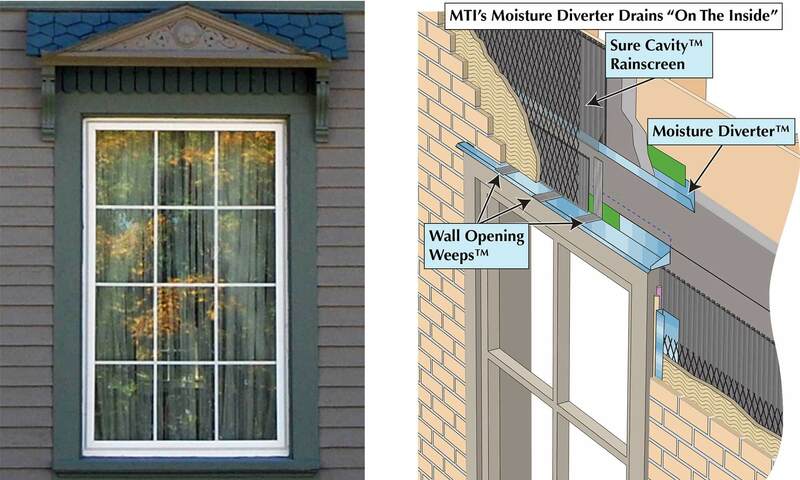 Moisture Diverter provides drainage at the top of the window (see Figure C.). 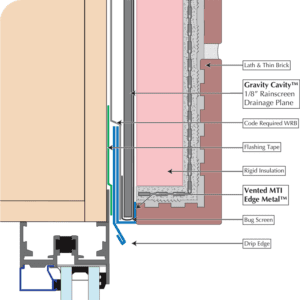 To provide drainage on the side, install Gravity Cavity strips on the sides of the rough opening (see Figure C.) and on the sides of the window frame. 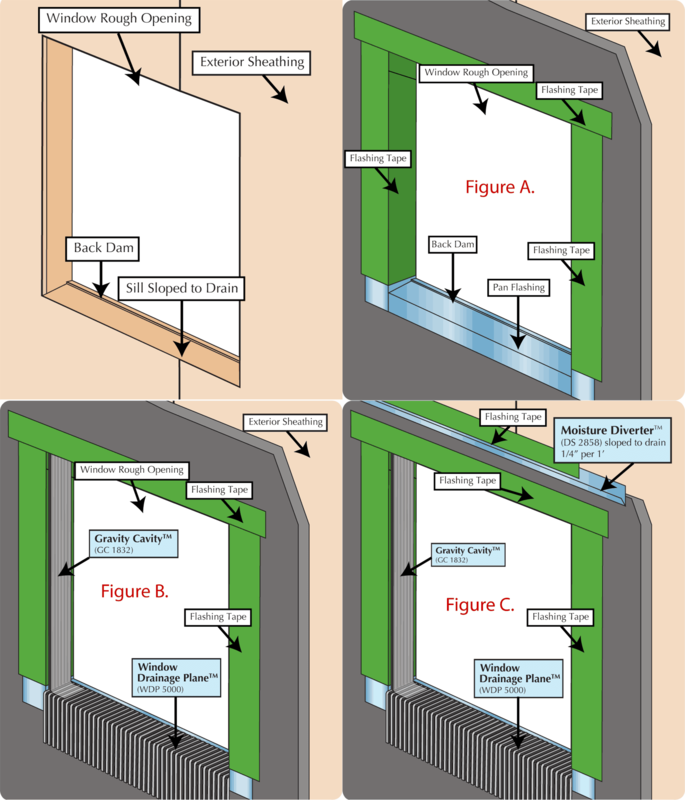 It is critical that these strips are centered on the sides of the rough opening and the sides of the window frame, and that the edges of the Gravity Cavity strips are at least 3/4-inch in from each edge of the rough opening (see Figure D.). Insulate the top, sides and bottomof the rough opening with low expasion foam. The Gravity Cavity will provide the drainage required for the side voids of the rough opening; the Moisture Diverter will provide drainage for the the top. The foam insulation will seal off the interior of the detail. Use Window Drainage Plane for drainage at the bottom of the rough opening (see Figure E.). The Window Drainage Plane will also provide a pathway for moisture to enter the rainscreen drainage plane system. Good construction design is identifying and prioritizing goals. (Do I want it strong? Do I want it lightweight? etc.) Sometimes the critical requirements of a construction detail or system infringe on long-held beliefs, and sometimes they seem to infringe on each other. Sometimes, they just seem like too much work. However, if our goal really is perfection, and if we really believe in sustainability and “going green,” we will seek what truly works. Materials, technology and methods are completely different than they were just a decade or two ago. Society’s needs have also changed and the push is on to be responsible, to limit our use of energy and to conserve other resources. We have the knowledge and the materials to conquer the “leaky, drafty window” problem. We just need to employ the will to get the job done!